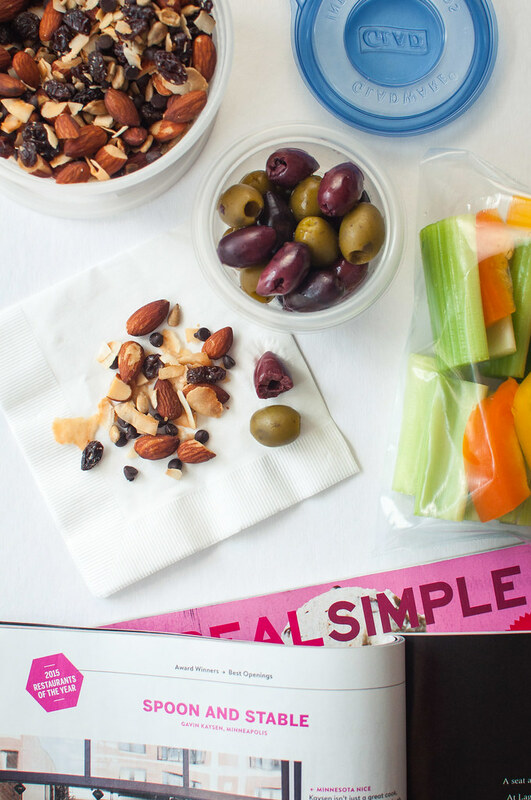 Earlier, in part 1 of the Healthy Food for Travel series, I shared my essential tips for packing healthy vegetarian snacks and meals for travel. True, many of them are common sense, but a few have been learned through trial, error, and big messes in my luggage. If it’s a big travel season like summer where you are, as it is in the U.S. right now, I hope you can use my tips as a quick resource to eat healthy, feel good, and flavor your adventure no matter where your next trip takes you. Now it’s time for the fun part of the series, featuring examples of what I actually pack in that well-equipped snack bag of mine. In other words, I’ll show you how to put my food and travel tips from part 1 into action with 10 ideas for simple, sustaining vegetarian travel snacks. It’s been a while since I published part 1, but it just so happened that after I wrote the bulk of this post, Blue Diamond sent me a couple travel-friendly canisters of almonds to try. They’re a super satisfying, healthy summer snack, so this “Flavor Your Adventure” post is sponsored by Blue Diamond Almonds. 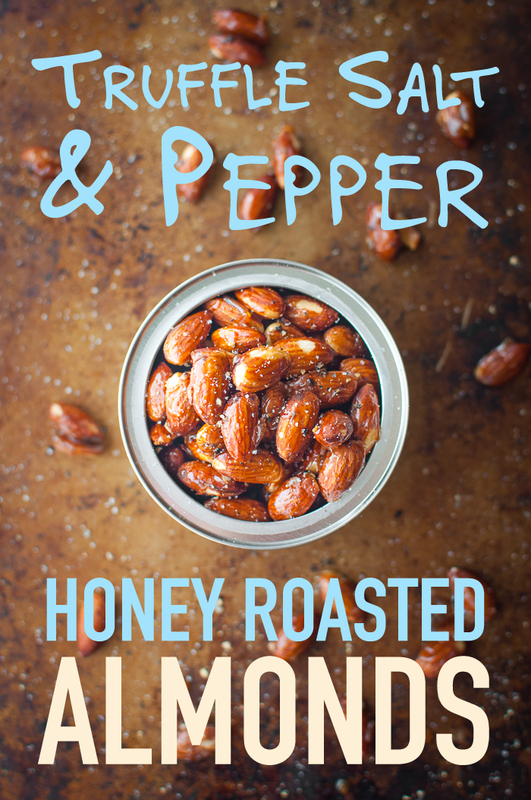 Click here to skip to my easy, addictive, one-pan salt and pepper honey roasted almonds recipe! I’m going to look for flights this week for my next trip home to Minnesota! Because…wedding planning! I’ll most likely be invading my parents condo for a week or two toward the end of the summer while running around tasting cake, flower shopping, and doing a hair test run. All decisions I haven’t even started to research yet (scared face). And the wedding is in fewer than four months. There are so many details up in the air, but you can rest assured that I’ll flavor my adventures with as many of these snacks as I can fit into my carry on. And, come November, I’m sure the wedding guests in our hotel block will be seeing cute packets of almonds and homemade trail mix. If y’all are reading–shhhh! It’s a surprise! It’s not necessary to bring every item on the list for a complete snacking experience. By all means, if you’re heading out on a 19 hour road trip with a huge cooler in tow, you most definitely would eat well by bringing every item. However, most of us, especially if we’re flying, are either confined by space or only need enough food to get us between domestic airports. 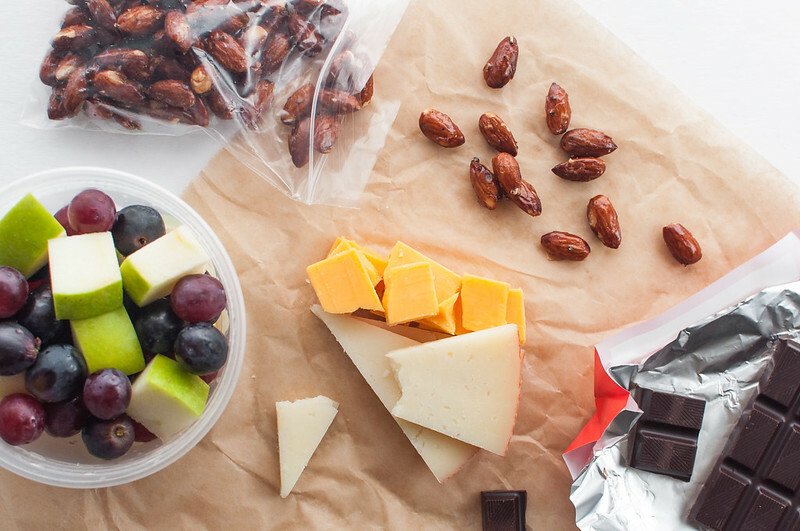 If you’re flying internationally, you’ll undoubtedly need to supplement with purchased or in-flight provisions, but bringing a few long-lasting snacks can help you feel good about what you’re eating when purchased selections are less than ideal. For domestic flights with travel time around six hours from door-to-door, I pick four to six snacks total from the following categories. And yes, I am always extra hungry. One selection can cover multiple categories if you’re really pressed for space. For example, lentils are both savory and substantial, and fresh berries can satisfy a mild sweet tooth. 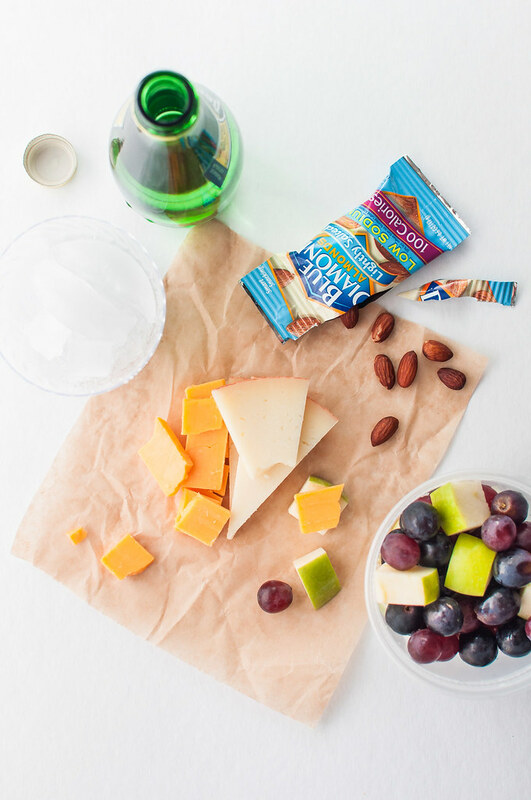 It’s easy to get a lot of mileage (pun intended) out of a couple thoughtfully selected snacks. The sky’s the limit–let your taste, experience, and creativity guide you. Ideas are divided between sweet and savory and are listed from easy to slightly more prep-intensive. If you’re pressed for time, go for the snacks toward the beginning of each list! 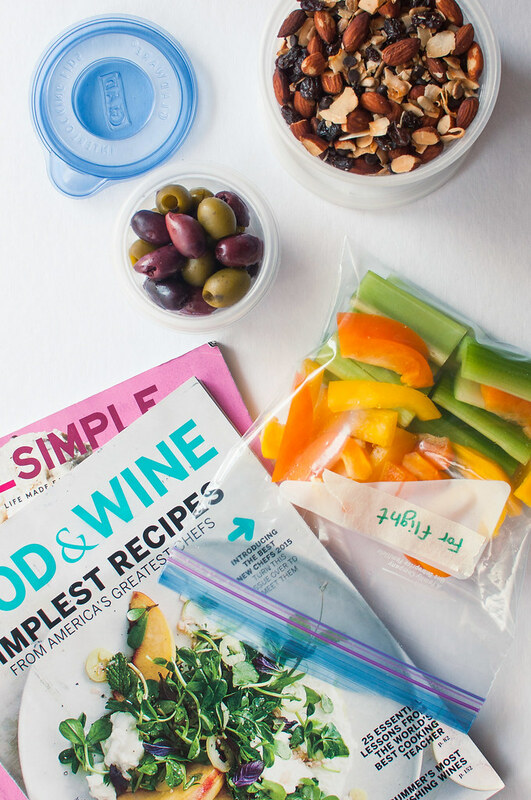 Cut up veggies in advance to keep you hydrated during travel. I don’t chew gum, so I find crunching on veggies to be a good, low calorie alternative any time of day, especially during takeoff and landing. 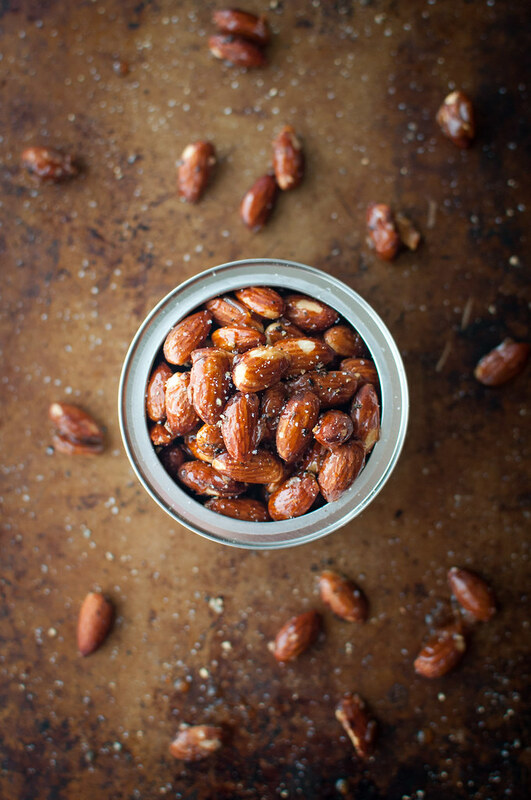 Lightly salted nuts, like Blue Diamond‘s roasted almonds, are perfect on their own for travel. Not exactly a vacation, but I went into NYC the other day to do some top secret stuff for my wedding dress(!) and have lunch with Steve. The afternoon extended much longer than anticipated as I discovered a college friend was in town for work. Five cocktails later, I was on the train back to Connecticut with Steve, and for the first time maybe ever, I didn’t raid the Grand Central convenience store for a giant bag of Cheetos. Nope, just magically whipped out this little pouch of almonds from my purse and it held me over ’til we got home and, um, ordered pizza. You win some, you lose some. My point is, you don’t have to turn these almonds into truffle salt and pepper honey roasted almonds to love them, but you know I’m all about the homemade over here, so I had to do some experimenting. And this recipe is decidedly in the win category. The best part about this recipe? Okay, there's two. You only need one pan for both the stovetop and oven portion, and you can throw the finished sweet and salty almonds right back in the can and hit the road once they cool! In a small, nonstick, oven-safe skillet heat honey over medium for a couple minutes until warm and fluid. Turn off heat and add almonds. Stir with a rubber spatula to coat thoroughly. Transfer pan, with almonds evenly distributed, to the oven and bake 10 minutes until bubbly and slightly darkened. Stir them once, after 5 minutes, making sure to handle the skillet with an oven mitt. 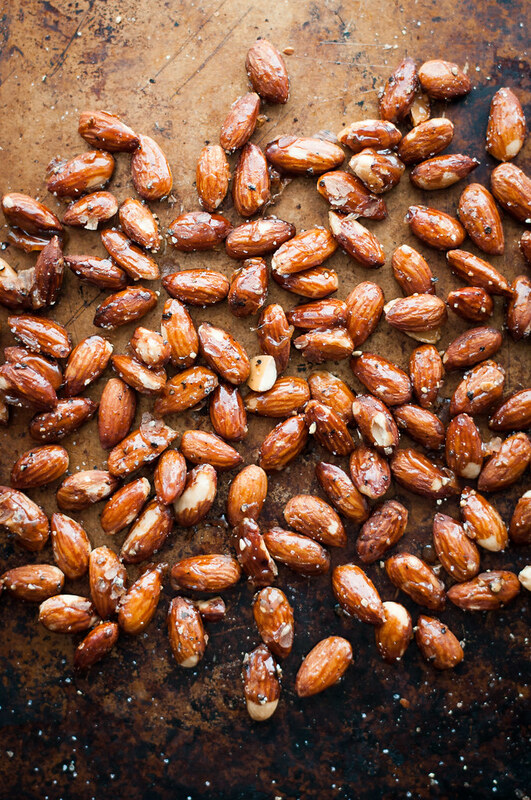 Spread a sheet of parchment paper or a silicone baking mat nearby while the almonds roast. In the skillet, immediately stir almonds together with pepper and salt. Quickly spread hot almonds on parchment paper in an even layer. Sprinkle with a little more pepper and salt and let cool completely, until honey is firm. 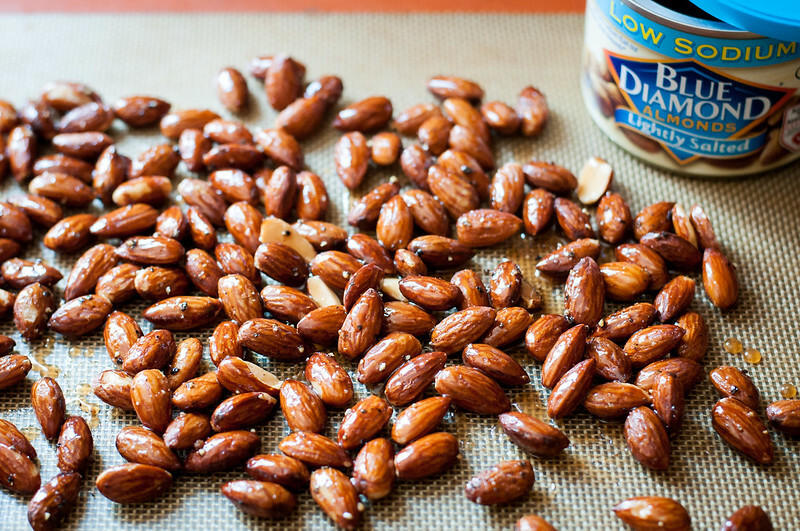 Break apart almonds and store in the refrigerator or a cool, dry place (if you don't eat them all right away!). Instead of a nonstick skillet, you can also use well-seasoned cast iron. To double, triple, or quadruple the recipe, just use a larger skillet. 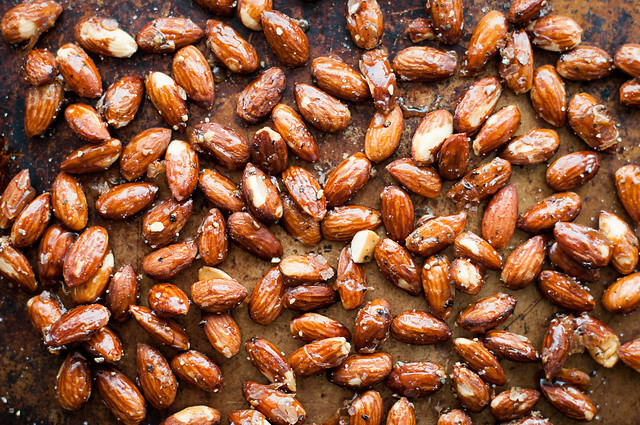 The almonds don't have to be in a single layer as they cook, just when they're cooling. As written, the recipe is gluten-free and vegetarian. To make it vegan, you could try substituting brown sugar, maple syrup, or agave nectar for the honey. I love brine-y kalamatas, but go with your favorite for a salty snack with healthy fats to keep you satisfied. Can, jar, antipasto bar–they all work. Just make sure to drain them before packing to avoid a mess. Beware of jealous passengers on your next flight. Unless you’re traveling with a cooler, hard cheeses hold up best at room temperature. I usually go with some combination of sharp cheddar, aged gouda (it’s much more firm than “regular” gouda), or manchego. Cut it into bite sized cubes or thick slices and pair it with nuts, apples, or crackers. This might sound tricky, but after reading how Heidi travels with lentils, I was hooked. Her recipe for lentils with wine-glazed vegetables works great to pack and is so much more delicious than the sum of its parts, but it doesn’t have to be that time consuming. Try simply packing plain cooked lentils, rice, potatoes, or beans with a bit of seasoning, then rejoice when you bypass airport or roadside fast food. Another completely healthy option to stay hydrated via food. Apples and grapes are the easiest and most tidy to pack and eat during travel. While dried fruit doesn’t have the benefit of hydration, it does pack more calories into less space. If, like me, you’re not the biggest raisin fan, try dried cherries, blueberries, or apricots. Typically I can find these three varieties unsweetened, unlike more tropical dried fruits, which tend to be loaded with sugar. For your sweet tooth! Super dark chocolate bars satisfy that chocolate craving without the sugar crash effect. Look for the highest percentage dark chocolate you can tolerate. Very dark varieties can taste bitter and lack sweetness you may be accustomed to, but over time they become an acquired taste, and even craving! Breakfast bonus: toss leftover trail mix into oatmeal from your hotel’s continental breakfast. The chocolate chips melt and sweeten your bowl, while the other components are healthy and textural additions. I’ve been topping my oatmeal with trail mix every day (might have made a little too much for the photo shoot!). Packaged granola works, too, but again, be on the lookout for heavily sweetened varieties. Yes, yogurt-covered raisins are delicious, but they don’t constitute a healthy snack when combined with M&M’s and a few peanuts. Instead of a preservative-injected gas station cookie, try a homemade treat. Muffins or bars don’t have to be time consuming. Next time you make a batch for any reason, double it, wrap half (or just a few) well, and store in the freezer. Then do your best to remember they’re in there next time you travel. For even more snack ideas to “Flavor Your Adventure” this summer, visit Blue Diamond Almonds on Facebook, Twitter, and (my favorite) Instagram. This page contains affiliate links. 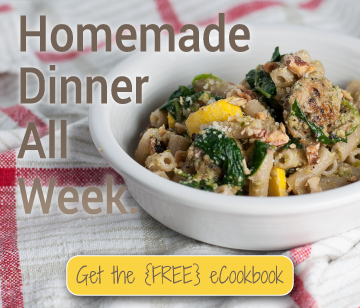 Affiliate links (to products I recommend, on Amazon) offset my ingredient and website maintenance costs, so I can keep bringing you easy, adventurous recipes like this one. Thanks! Amanda, hope it helps on your next trip–thanks for reading! Thanks for these last 2 posts! We have a trip coming up and I have been daerding the drive! We have some trips where the twins are awesome & then others where they scream the entire 2 1/2 hours. That doesn’t seem like a long trip until you have crying babies the entire distance : ) I especially love the cookie sheet/chalkboard idea – awesome!